Why does nuclear energy matter? For most people, nuclear energy is not exactly a daily topic of thought. And why should it be? Although we understand the dangers of nuclear weapons, all but a few of the world’s nuclear plants have operated for decades without any major problems. Besides, understanding how nuclear reactors operate or how nuclear energy plays into our energy production as a whole can be a challenging task. But whether we educate ourselves or not, nuclear energy is a part of our life. 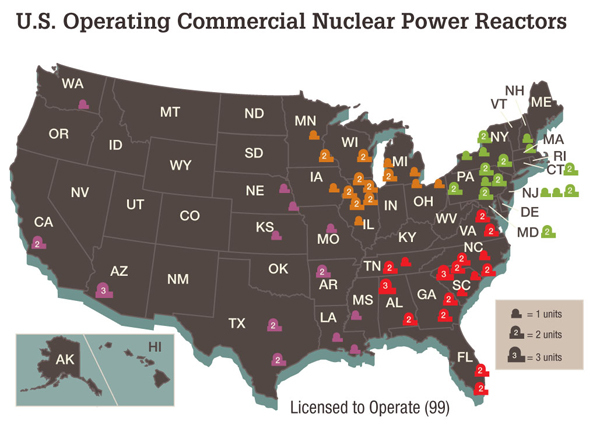 In the United States alone there are 99 nuclear reactors licensed to operate (see map below), and these reactors provide about 20 percent of the electricity produced nationwide. The fact that we all use electricity provided in part by nuclear reactors, and that many of us live near the reactors themselves, makes it crucial for us to continue asking questions about nuclear energy. To carry on using a force as powerful as nuclear fission without critique or exploration would seem not only irresponsible to future generations, but potentially dangerous for people living today. The desire to pursue these difficult questions, and examine how a nuclear power plant can impact the political, social, and ecological world it is a part of, is what inspired our research on McGuire Nuclear Plant. McGuire Nuclear Plant is a Duke Energy owned power plant located in Huntersville, North Carolina, only a few miles South of Davidson College. Duke Energy is the largest electric power holding company in the United States, and McGuire Nuclear is one of three electric generating plants they own on Lake Norman. Although McGuire Nuclear Plant has not been the focus of much local protest or the subject of any major controversies, it still plays an interesting role in the surrounding community. We have explored several of the ways McGuire influences the surrounding area, as well as how national and global politics have impacted McGuire. Click on the links below to see what we have discovered about McGuire Nuclear Plant and it’s role in the community! Nuclear Policy Timeline– Look at historical and political changes that have occurred on a global and national scale, and see how they have changed operations at McGuire. Using our interactive timeline you can see how these issues have shifted over time. Hot Hole Fishing– McGuire Nuclear Plant has significant impacts on the surrounding environment, which include warming the water near the plant and changing lake currents around it. We explore the issues that this can have on local fisherman as well as lake ecology here. Recycling Nuclear Waste into Fuel– Using nuclear fuel brings with it lots of complicated political issues as well as environmental ones. Although it is possible to recycle most of the nuclear waste we produce, it typically ends up sitting in dry storage. Find out why McGuire almost ended up being one of the first U.S. nuclear plants to use recycled fuel, and why it eventually fell through. Sources– Research the issues yourself using the same sites and resources we discovered.